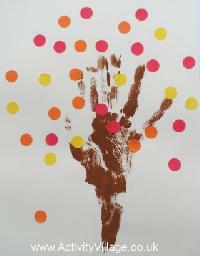 Handprint crafts are always a favorite with young children. Kids love to leave their handprints. 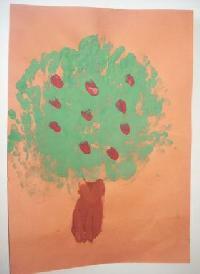 Use lots of green handprints to make a roughly round shape for the top of the tree. Underneath use the side of the hand to create a brown line for the trunk. When the tree is dry add red fingerprints for the apples. This is a lovely craft for younger children, who will enjoy both the hand painting and printing and the sticking on of stickers. 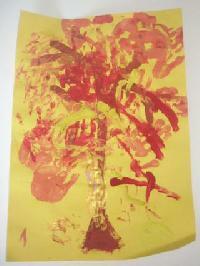 Go wild with some bright autumn colours to create this autumn tree painting, and capture your childs hands in time! 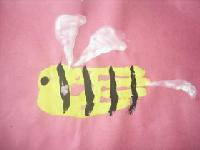 This cute little bumble bee is easy to create with some poster paints and your childs handprint. 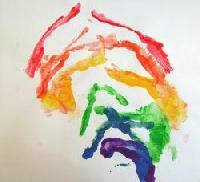 Encourage your children to let their imagination run riot with this colourful butterfly handprint painting.. This fingerprint rainbow is a fun activity for little ones perfect for St Patricks Day, a Noahs Ark or general rainbow theme. This flag handprint wreath makes an excellent group project for international days or sporting events such as the Olympic Games and it makes a stunning wall or table decoration too! 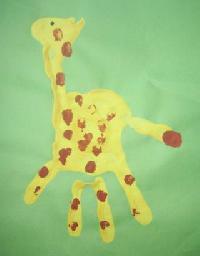 Have some fun with this cheeky giraffe handprint painting.. 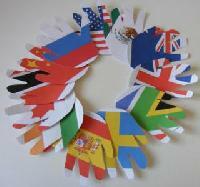 This hand banner craft makes a good class or family project. Why not make the banner long enough to circle a room so it joins together in a unified circle? 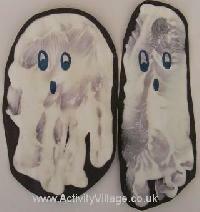 These handprint and footprint ghosts are so effective and, if you remember to date them, a great way of capturing a memory of your child.